Declared a UNESCO World Heritage Site in 1985, Kaziranga National Park is renowned for having the largest population in the world of the prehistoric looking one-horned rhinoceros. Much of the park's terrain consists of swamp and grasslands, making it the perfect habitat for these creatures along with about 40 major mammals. These include wild elephants, tiger, buffaloes, gaur, monkeys, deer, otters, badgers, leopards, and wild boar. The birdlife is also impressive. Thousands of migratory birds arrive at the park every year, from distant lands as far away as Siberia. Kaziranga is a substantially sized park, covering approximately 430 square kilometers. In particular, it stretches for 40 kilometers (25 miles) in length from east to west, and is 13 kilometers (8 miles) wide. 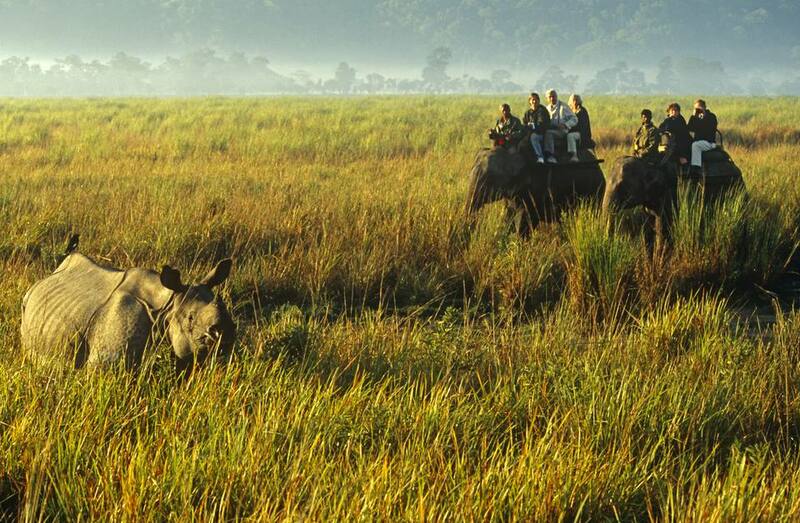 This Kaziranga National Park travel guide will help you plan your trip there. The park is situated in the state of Assam, in India's Northeast region, on the banks of the Brahmaputra River. It's about 220 kilometers (137 miles) from Guwahati, 100 kilometers (60 miles) from Jorhat, and 75 kilometers (47 miles) from Furkating. The main entrance to the park is at Kohora on National Highway 37, where there's a Tourist Complex and booking offices. There are airports at Guwahati (which has flights from all over India) and Jorhat (best accessed from Kolkata). Then, it's a five hour drive from Guwahati or a two hour drive from Jorhat, in private taxi or public bus. From Guwahati, expect to pay around 300 rupees by public transport and 5,000 rupees by private taxi. You can get a taxi at the airport. Some hotels will provide pick up services as well. Buses and shared vehicles to Kaziranga are available from Palthan Bazaar, near the railway station, in Guwahati. The nearest railway stations are at Jakhalabandha, one hour away (trains run there from Guwahati, take the Guwahati-Silghat Town Passenger), and Furkating (trains from Delhi and Kolkata). Kazaringa is open daily from November 1 to April 30 every year. (However, in recent years, certain parts of it have been opened earlier in October to increase tourism. It depends on accessibility after the monsoon). According to locals, the best time to visit is during late February and March, when the December and January peak season rush is over. The park gets extremely busy during the peak season, and it's likely to negatively affect your experience there due to the large amount of people allowed in. Be prepared for hot weather from March to May, and cold weather from November to January. A week-long Kaziranga Elephant Festival, held to encourage people to save and protect elephants, takes place at the park from February 11-17 every year. The park has four ranges -- Central (Kohora), Western (Bagori), Eastern (Agoratuli), and Burhapahar. The most accessible and popular range is the grassy Central one, at Kohora. The Western range, 25 minutes from Kohora, is the shortest circuit but has the highest density of rhinos. It's recommended for seeing rhinos and buffaloes. The Eastern range is around 40 minutes from Kohora and offers the longest circuit. Birding and wetlands are the highlights there. The Kaziranga Tourist Complex is located just south of Kohora. Facilities include the range office, booking office, and jeep rental. Jeep and elephant safaris are to be booked at the Tourist Complex, or by hotels. There's no online booking facility at the moment. The park is open for jeep safaris from 7.30 a.m until 11 a.m. and 2 p.m. until 4.30 p.m. These safaris are for two or three hours. One-hour elephant safaris are conducted in the morning between 5.30 a.m. and 7.30 a.m. The elephant safaris take place in the Central and Western ranges. However, foreigners are only allowed to go on these safaris in the Central range. The safaris in the Central range are managed by the forest department, while the ones at the Western range are provided by private companies. The main difference is how the elephants are trained -- elephants used by private companies have not been put through formal training, making it more risky to ride them. The mahouts (riders) may also be inexperienced. This affects the quality of the safari experience. Bookings for elephant safaris in the Central range can only be made the evening before, at the Tourist Complex booking office. Foreigners are given priority, and will need to show their passport and visa. If any tickets remain in the Central range, they'll be made available to Indians. There's also a separate line for women. Jeep safaris can be booked on the spot. Jeep hire is paid per jeep. So, it's a good idea to wait around and try to join a group if you're traveling solo or as a couple. This will reduce the cost. The park entry fee is 100 rupees per person for Indians and 650 rupees per person for foreigners. Elephant safaris cost 900 rupees per person for Indians and 1,950 rupees per person for foreigners. Do not that you'll need to pay for transport to the safari starting point from your hotel. This may cost anywhere from 500-900 rupees. The jeep fee is based on distance to be traveled. It depends on which zone you'll visit and the hotel you're staying in. The fee costs from 1,750 rupees for the Central range to 2,750 rupees for Burhapahar, per jeep. There's a 300 rupee road toll per vehicle for Indians and foreigners. If you're taking a still camera inside the park, the fee is 100 rupees for Indians and 200 rupees for foreigners. Professional cameras cost more. For video cameras, it's 1,000 rupees for Indians and foreigners. A guard fee of 25 rupees is payable, per person. If a vehicle is being taken inside the park, the guard fee payable is 100 rupees. Elephant safaris are a much better option for rhino viewing than jeep safaris. It's possible to see the rhinos up close on the elephant safaris. Try to avoid the first safaris of the morning in winter though, as fog and late sunrise hamper viewing. Those who are concerned about animal welfare and treatment of elephants may want to avoid taking an elephant safari. Aim to see both the Central and Western ranges on jeep safari, as they're both very different in terms of landscape and foliage. Boat rides are possible at the Eastern range. All budget hotels are in Kohora, near the Central range. It's convenient to stay there, as both the Western and Eastern ranges are equally accessible from there. To be as close as possible to nature, try the inexpensive Nature-Hunt Eco Camp. Also, Jupuri Ghar has basic cottages conveniently inside the Tourist Complex, a short walk from the Central range office. It was once managed by Assam Tourism, but is now leased out to a private operator. One of the most popular Kaziranga hotels is the new and sprawling IORA - The Retreat resort, located on 20 acres of land just a couple of kilometers from the park's main entrance. Best of all, it's reasonably priced for what's provided. Diphlu River Lodge is another new hotel, located around 15 minutes west of the tourist complex. It's a unique place to stay, with 12 cottages on stilts overlooking the river. Unfortunately, the tariff for foreigners is double that for Indians, and it is costly. Wild Grass Lodge is a reputable budget option that's popular with foreign visitors and backpackers, located in Bossagaon village, a short drive from Kohora. Its safari rates are a bit less than other similar hotels. Note: As an alternative to visiting Kaziranga, lesser-known but nearby Pobitora Wildlife Sanctuary is smaller and has the highest concentration of rhinos in India.